Obviously the Referendum on the Constitutional declaration of March 2011, right? Ok, now when people voted for the constitutional declaration, they didn't just vote for a timeline of when things will happen, but for the legality of it as well right? I mean after all what is a constitutional declaration but a legally binding transitional constitution with all that it entails including judicial review of constitutionality of laws issued and the legality of bodies formed by those issued laws? Obviously they voted for it to be their temporary legally Binding transitional constitution. Now, When the people voted for their president (in this case Morsy), they voted for him based on his status in the Constitutional declaration, that obviously the majority of the population voted for, right? Still with me? Good. Now when a president is elected, swears to respect the constitution and/or ratifies that constitutional declaration, it means he agrees with the legality of the constitutional declaration right? He also agrees and does not deny that it's a legally binding document, and the will of the majority of the people right? Obviously so. Otherwise he would have neither sworn to respect it and follow it, nor ratified it. So when the "Elected" president turns dictator (or if you don't like that term, issues a unilateral decree), and stops the courts from issuing verdicts on the legality of the constitutional assembly, or the Shura council, And also submits himself above judicial authority, That basically means he's ignoring the will of the majority of the people that voted to allow the Constitutional Declaration of March 2011 to be their legally binding transitional constitution, with all that it entails including but not limited to Judicial review of legality right? Of course he is ignoring the will of the majority. So remind me again, how is it Morsy's actions have any form of "Legitimacy" with the majority? How is it a factor of "Legitimacy" again? How are Morsy's actions "Respecting Democracy"? Those Judges declared that Morsy won the elections. Those Judges supervised every election in which the MB won a majority. Morsy does not have a super majority (75% + of votes) in order to legally (or Illegally) claim his unilateral decree of dictatorship to be a popular mandate. Most importantly, Judges cannot judge without the law and facts presented. In other words if a Judge gives an illegal verdict, it can be easily proven with the facts publicly available on the case. In fact, they STATE clearly which Constitutional Articles/laws and such they based their decision upon. So why are you afraid of them again? 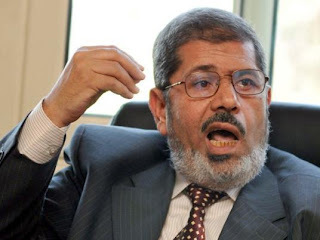 Again I ask, how is it Morsy's actions have any form of "Legitimacy" with the majority? How is it a factor of "Legitimacy" again? How are Morsy's actions "Respecting Democracy"? Kindly use your brains before they atrophy.